We are Nicholas J. Dorsten, and Rex R. Blake, Shareholders in Blake & Dorsten, P.A. If you are looking for experienced criminal or personal injury trial attorneys to assist you in any criminal or injury matter that you may have, then you have come to the right place. 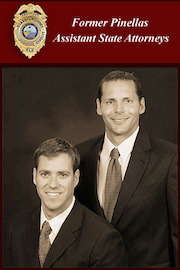 Please allow us to tell you a little bit about ourselves and what ultimately led us to start Blake & Dorsten, P.A. Click on the names below to view the full attorney profile.